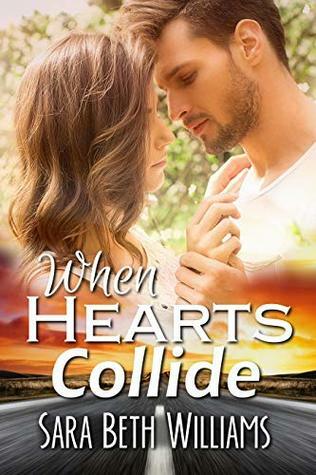 When Hearts Collide (2018) by Sara Beth Williams is a FABULOUS debut novel. This book currently comes in eBook form, and is 279 pages in length. With a full-time job and a busy six-year old, this book took me three days to read. I received a copy of this novel in eBook form from the author. In no way has this influenced my opinion of the story. All opinions expressed in this review are my own. I give When Hearts Collide 4.5 STARS. This book is a Contemporary Christian Romance. A reckless mistake landed Jacob “Jay” Mathews behind bars, but it was his inescapable guilt that led him to God. Upon his release, with the help of a spiritual mentor and friend, he strives to move forward with his life. Determined to graduate college, get a job, and follow God’s word, the last thing Jay needs or wants is a girlfriend. Until he meets Lacey Bennett. When fervent prayers for reconciliation between her divorced parents go unanswered, and her older sister tragically dies, Lacey questions how God could allow such tragedies to befall her family. Turning her back on her past and God, she focuses on her future. College and theater are her ultimate goals; falling for the one type of guy she swore to avoid—a Christian—is not. No matter how much she wants to resist, Jay is irresistible. As their relationship deepens, Jay struggles with Lacey’s unresolved anger and her unwillingness to even discuss faith. All he wants to do is reveal how God changed his life, but doing so would mean revealing his status as an ex convict. Finally, as she begins to rekindle her faith, past secrets collide, threatening to destroy everything they’ve built. Now, Jay must rely on his faith more than he ever has before. Can they learn to forgive—or is their relationship fractured beyond repair? Jacob “Jay” Matthews, the hero of this story, is my favorite of the two protagonists. I feel he is written very realistically, and many of his struggles over the course of the novel were easy to relate to. From the first moment he meets Lacey there is undeniable chemistry. But, he has a secret from his past that he is reluctant to share. He really wants to share because he recognizes that truth in a relationship is paramount, but he feels strongly that revealing his secret would lead to embarrassment and shame. He is certain Lacey would ditch him to the side of the curb faster than you can say, “Good bye!” if he told her the secret of his past. Instead, he continues to hide the secret and it festers and festers until it becomes too big to handle. The not telling eats at Jay, and it even leads to a personality change. When the truth blows up in his face and everything is revealed, things get even worse because he kept the secret long past when he should have told. This aspect of the novel reminded me of John 8: 31-32 (CSB): “Then Jesus said to the Jews who had believed in Him, ‘If you continue in My Word, you really are my disciples. You will know the Truth, and the Truth will set you free.” I understand that the Truth Jesus is speaking of is His Word, but I do think it also applies to all levels of truth. Not telling the truth in any situation does sit on a person like a big block wall pressing into one’s center. Telling the truth relieves a person of that stress. It does, in a sense, set a person free! Unfortunately, Jay, like many, many young people today, realizes this a bit too late, and his secret keeping causes unintentional pain. Another aspect to this novel I loved is the discussion that God’s ways are not man’s ways. We humans get so focused on our plans and the paths we are carving out for ourselves in this world that we forget about God. We forget He is the master planner. Both Lacey and Jay ask some really tough questions over the course of the story — “God, why did you let this happen?” and “God, what are you doing to me?” to name a couple. We all ask questions like this, especially when our lives feel like they are falling apart and our plans for ourselves don’t seem to be amounting to much. Of all the lessons we could teach our teens today, I think this may be one of the most important for them to take to heart. We humans don’t have to get what God is doing. We see such a small part of God’s plan. But, we do need to respect and accept that God is the Boss. His plans for us are so much better than we could ever imagine even when it looks like our world is breaking. Trusting God through the think and the thin is key to a much more contented life. There is quite a bit packed into the pages of this wonderful novel that this one review cannot do it justice. I very much enjoyed my time with Jay and Lacey as they went through some seriously tough stuff during a very vulnerable time in their lives. Personally, I loved this story and I am sad my time with these characters is over. I found the story to be fast-paced, heart-wrenching, and completely relatable. While I greatly appreciated and enjoyed this book, I do think the best audience for When Hearts Collide would be an older teenager. The messages and Biblical principals in this book are concepts every teen needs to think on and take to heart. If I had the budget, I would buy a copy of this book for all of my students today! Lovely review! I’m sitting here wondering what would happen if teens actually read the books we recommended to them lol.